Fastest 40 Yard Dash? Usain Bolt or Deion Sanders? Go straight to the end of the article for my opinionated video. Deion Sanders is listed as the WR for the 40 yard dash with 4.17 on Wikipdia. 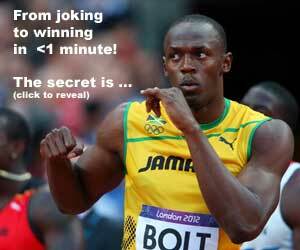 But was it really the fastest 40 yard dash ever? I’ve been interviewed by several media outlets on this topic over the past 2 years, and I think it’s time to put the argument to rest. Well, sort of. There are so many variables, and I discuss them in the video. Therefore, I suggest at 36.6m away, add 0.20 sec to a hand time with the runner 40 yards away. 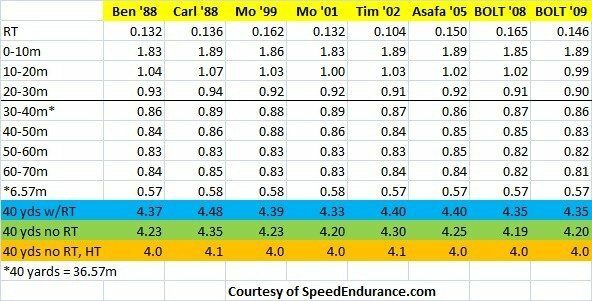 In the video, I made a slight “error” when I said the fastest 40 was Bolt with a 4.35 (with RT). But it’s actually Mo with a 4.33. When you subtract the RT, then Bolt wins, but it’s ever so close between Mo and Bolt with 4.19 and 4.20. Having been a pretty piss-poor college (American) football player myself, in my opinion Primetime would have had his jock handed to him by Mo, Usain, roided-up Ben/Tim, Carl, and Asafa in a 40. I was not the fastest guy on the field but ran the fastest 40 (4.37HT)on the team in camp my sophomore year wearing track spikes – enough to engage a sarcastic response from the head coach about the skinny white kid running fast. I think there was also a Spike Lee reference “its gotta be the shoes” from him too, prohibiting track spikes from that point on! Football guys can’t run with the true top track guys, just like track guys can’t really hang playing football at the highest level (I know there are exceptions, but very few truly at the most elite level). It is simply the law of specificity once you get to the professional level. The two are wired differently. Yeah but Deion was a football/baseball player….lets see how fast those guys are after taking a few or giving a few big hits….. Lets not forget Louie that Dieon Sanders ran 10.26 w.06…so remember he was a professional football & baseball player. Only guy to win a superbowl and world series. So if he trained at track and not just run it to see what he could run, the sky is the limit. o yeah i am a Dieon Sanders fan and always stopped eveything to watch Primetime. I ran 4.3 in high school but took at track scholarship instead, but Dieon Sanders was flat out fast. Doesnt matter, if his time went into track like it did for the 2 other sports you would be having a different convo all together. Also, you have blocks on the mondo and in spikes….to major differences. If you have ever run on the field turf you will know that there is a huge difference. I am not disputing Neon was fast, but also remember that football coaches aren’t known for their proficiency in operating a stopwatch!! Hey Jimson, good blog & site! i love the accumulation of all of the research. 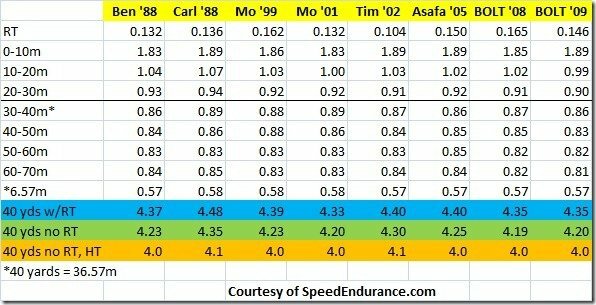 i wanted to add an important variable to your equation for the “Fastest 40yd Dash?” debate. The NFL Combine testing is run solo, where? you lose the natural advantage of competition pushing you like the head-to-head competition on the track. i’m not certain there exists a mathematical formula to take that into account. But in my very humble opinion, its a very important one. Hey you forgot Bo Jackson, ran a 4.12 old turf at combine and like a few days later ran a 4.18 on pro day. Not sure if the second one was on grass or the old turf at Auburn.